W.H. Rhodes, Phase Chemistry in the Development of Transparent Polycrystalline Oxides. 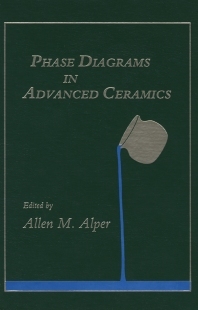 J.J. Brown, Jr., The Use of Phase Diagrams to Predict Alkali Oxide Corrosion of Ceramics. W.B. Johnson and A.S. Nagelberg,Application of Phase Diagrams to the Production of Advanced Composites. T-Y. Tien, Use of Phase Diagrams in the Study of Silicon Nitride Ceramics. A.J. Pyzik and A.M. Hart, The Use of Phase Studies in the Development of Whiskers and Whisker-Reinforced Ceramics. Chapter References. Subject Index. The investigation of multi-component complex systems composed of oxides, nitrides, and carbides has intensified in the last few years. Phase Diagrams in Advanced Ceramics reviews some of the recent advances inthe understanding of these composite systems, providing insight into how phase diagrams can be utilized in the fabrication of whiskers and ceramic-matrix whisker-reinforced ceramics. Phase relations and sintering information is reviewed for transparent polycrystalline oxides. Phase diagrams are discussed to predict alkali oxide corrosion of alumino-silicate references.